In this tutorial we will implement the vector functions that are used in other tutorials on this website. To be more exact: we will implement what is commonly known as Vector2(x, y), Vector3(x, y, z) and Vector4(x, y, z, w) in other languages. While we could implement Vector2, then Vector3 and then Vector4 functions we will simply make use of Clojure's functional nature and just go with Vector-N which will work with any dimension. If you never heard about a Vector, it is a data structure that represents (for example) a monster's position in a game world. It has several components like x(the horizontal position) and y(the vertical position). If the monster lives in a 3D world then it also has a z component (the height). As mentioned before, Clojure already has a vector data structure. We will make use of this data structure and simply create a few functions for things like vector multiplication, scaling, dot product, normalization and so on. While this looks cool, it has the downside of not being dimension independent because we manually have to name the keys like :x, :y, :z, :w and so on. This would be a problem for something like Vector-100. Where a function is mapped (in other words: applied) onto every element in the list. Or in other words: if we use map with multiple arguments then they are zipped together automatically. This is good because it keeps us from writing a lot of weird looking code. Note: since we usually want vectors as results, we often use mapv. As we will see soon, comp allows us to write some complicated things in a very elegant way. What happens is that map first zips together the components so we have ([u.x v.x] [u.y v.y] [u.z v.z]), then it adds them together because we used map +. The second version looks a bit weird, but it does exactly the same. The difference is that we created a function composition that works for more than two arguments. The function works exactly like v+, just with a minus. It gets even easier now. Two vectors are considered equal if their corresponding components are equal, or in other words: if u.x==v.x and u.y==v.y and so on. We use == instead of = to properly compare floating point values with a certain precision tolerance. Again the components are first zipped together by map, then they are compared with == so we get something like [true true false] if the x and y components were equal, but the z components were not. Afterwards the vectors are considered equal if the previous result contains only true values like [true true true]. Now the length of that arrow is exactly the length of the vector. Again we used comp here to express 'use v-len-sqr and then use sqrt' in a very elegant way. Note: we called the function v*, however there is no real vector multiplication in mathematics. 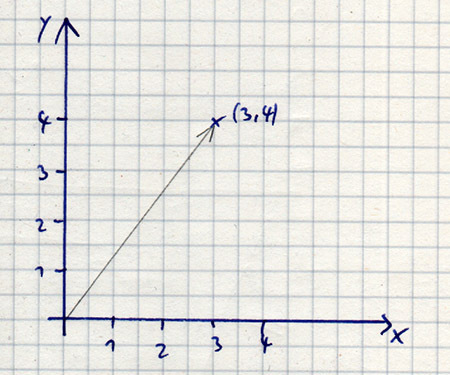 There are things like dot-product, cross-product and scale. And because scale is used very commonly, we will call it v* here. Like in the above picture, the function first subtracts the components from each other by using our previously created v- function, then does the square and square root thing. Since we already did that in our v-len-sqr and v-len functions, we just reused them here. And thanks to comp, this looks really elegant. (if (every? (partial == 0) u)       ; [0 0 ...]? This looks a bit weird, but it works. The if checks if u is a null vector like [0 0 0] (or [0 0] depending on the dimension), in which case it returns [t 0 0], otherwise it changes the length of u. As usual our map function zips together u and v, then it multiplies them because we used *. And in the end we sum up the results by using reduce +. Now we have a handful of vector functions that can be used with any dimension that we need. It will come in handy soon!